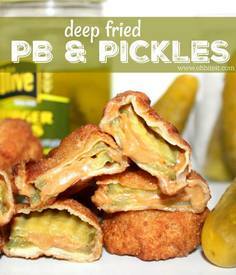 Deep fried pb & pickles! Have you ever found yourself curious, confused, disgusted, and interested.. all at the same time? If not, well.. this recipe might not might change that. Those of you who are the daring and proud pb & pickle sandwich eaters, this is the recipe for YOU!